If you’re anything like me, you may imagine how much better a classic dish would taste with the addition of green chile! 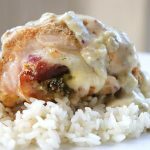 Today, I’m sharing just that – a classic chicken cordon bleu, with the addition of New Mexican green chile, or if you will, Pollo Cordon Bleu! A few months ago, my boyfriend and I had a lunch date at Mykonos in Albuquerque. On the menu they had a chicken cordon bleu dish stuffed with green chile, and I knew immediately that is what I would order. It was delicious, spicy, and everything I hoped it would be! I can’t find it on their menu anymore, but I have thought about it frequently since then. So, I decided to recreate something similar! 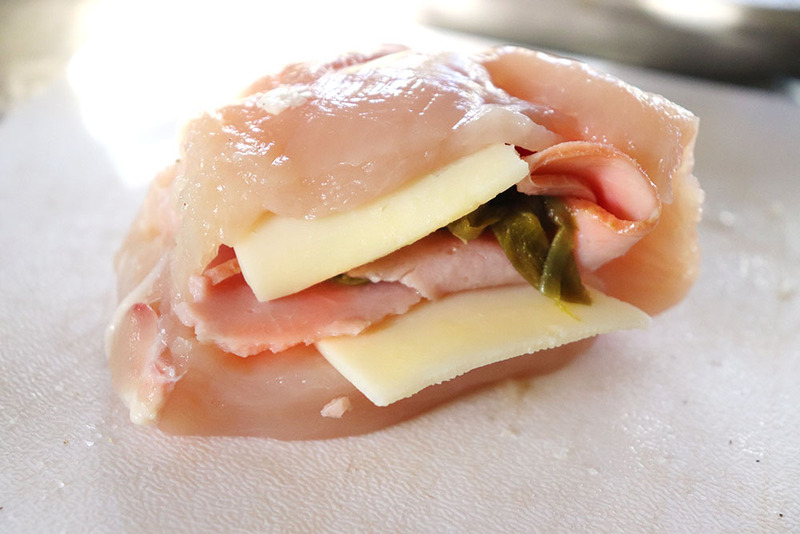 For this recipe, I took a chicken breast, split it and stuffed it with ham, swiss cheese, and a good amount of green chile. It was dredged with an egg mixture, then bread crumbs, and baked until crisp on the outside, but still juicy in the middle. 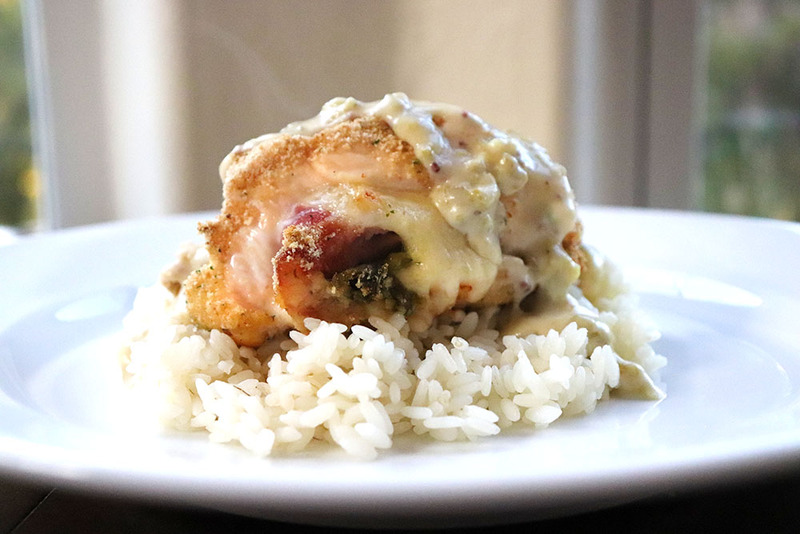 I then created a creamy mustard and green chile sauce to pour over the pollo cordon bleu. Let me tell you, it’s phenomenal and packed with tons of savory, salty, and spicy flavor. Start by taking a boneless, skinless chicken breast and cutting a slit in the middle. 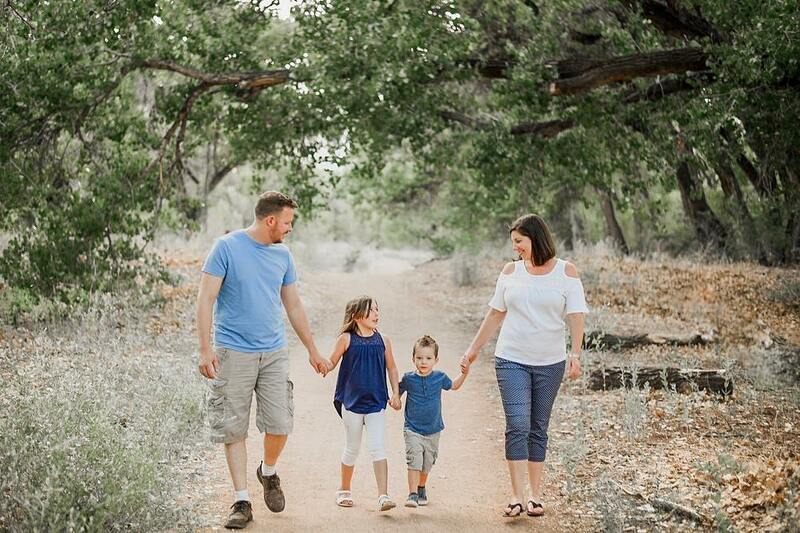 Insert a piece of ham, swiss cheese, and green chile. I used chile strips that I harvested earlier this month, but if you only have access to canned or frozen green chiles, that totally works, too! Secure the opening with one or two toothpicks. Next, combine an egg with milk in one dish, and add breadcrumbs to another dish. Dip the stuffed chicken in the egg mixture, then cover it with breadcrumbs. Set on a greased baking dish, and repeat for remaining chicken breasts. These get baked in a preheated oven for 30 – 35 minutes. 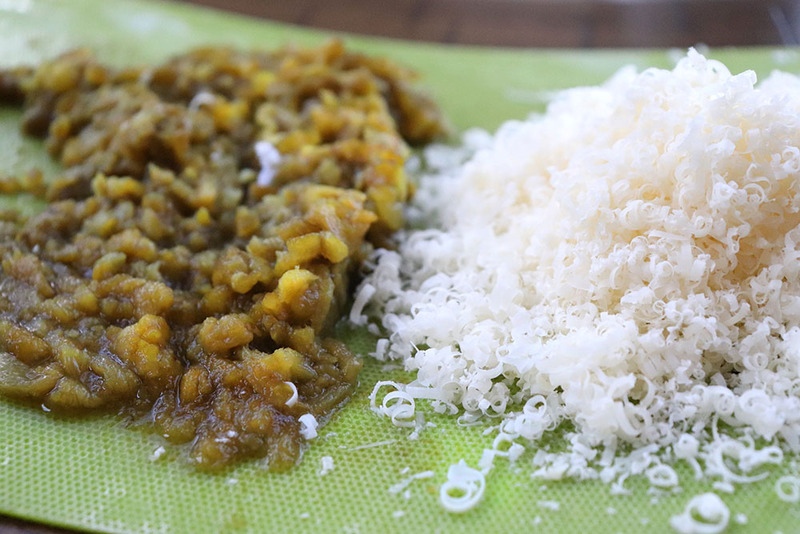 Meanwhile, you’ll make the green chile and mustard sauce by melting butter, adding in flour, and whisking in milk. To this green chile and dijon mustard are added, and ultimately finished off with parmesan cheese, salt and pepper. Once cooked, the pollo cordon bleu is served well over steamed rice, mashed potatoes, or egg noodles. Drizzle the green chile and mustard sauce on top, and dig in! Do you want to print out this recipe to hang on your fridge or share with a friend? Here is a printable version! 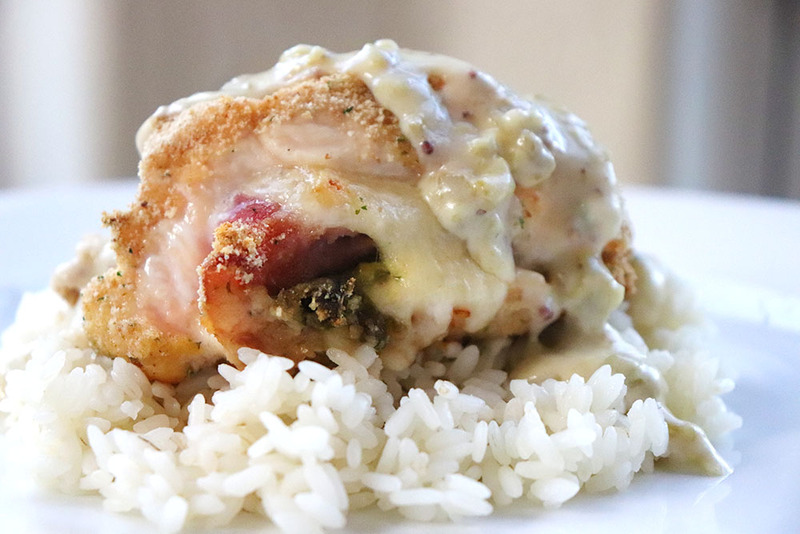 A New Mexican twist on the classic chicken cordon bleu! 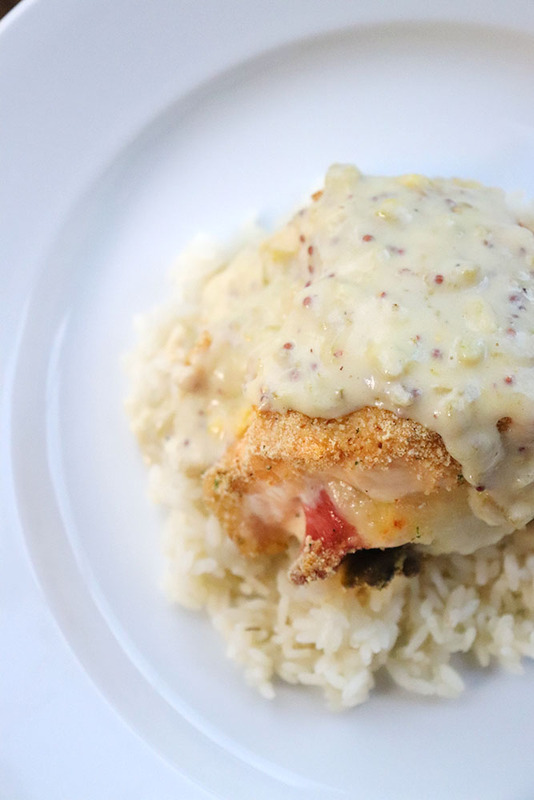 Pollo Cordon Bleu is made with chicken breasts stuffed with green chile, ham, and cheese, breaded and baked, then topped with a creamy green chile and mustard sauce. Preheat oven to 350 degrees. Coat a baking sheet with nonstick cooking spray. Cut a slit into the center of each chicken breast. Stuff each with one slice swiss cheese, one slice ham, and 1 tbsp of green chile. Close with one or two toothpicks. Whisk an egg in a bowl. Add breadcrumbs to another bowl. 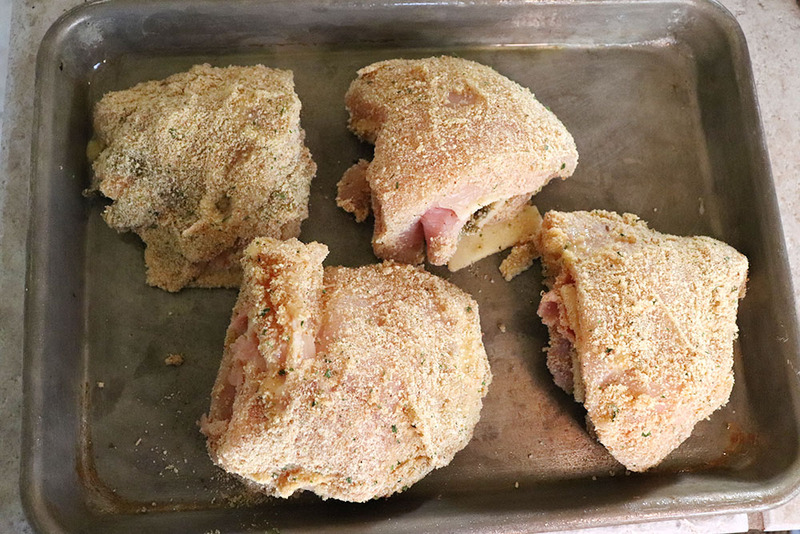 Dredge stuffed chicken breasts in the egg, then coat it in breadcrumbs. Place on baking sheet and repeat for remaining chicken breasts. Bake in preheated oven for 30 - 35 minutes, until chicken is no longer pink in the middle. Meanwhile, melt butter over medium heat. Sprinkle in flour and whisk until no clumps remain. Slowly pour in milk, whisking constantly. Add in dijon mustard and 1/4 cup chopped green chile and bring to a boil. Simmer for 2 minutes, then add shredded parmesan cheese, and salt and pepper, to taste. Remove from heat. 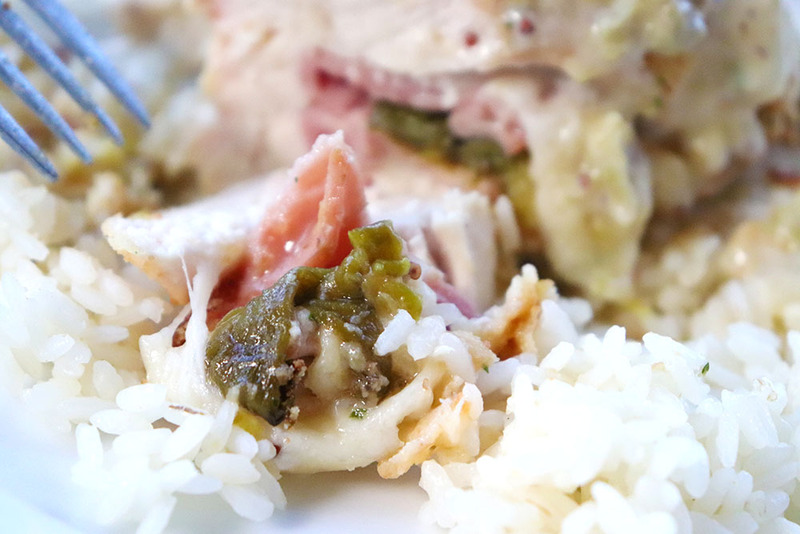 When chicken is cooked, serve over rice, potatoes, or noodles, and top with green chile and dijon sauce.